Virar is an interesting, useful verb in Portuguese. 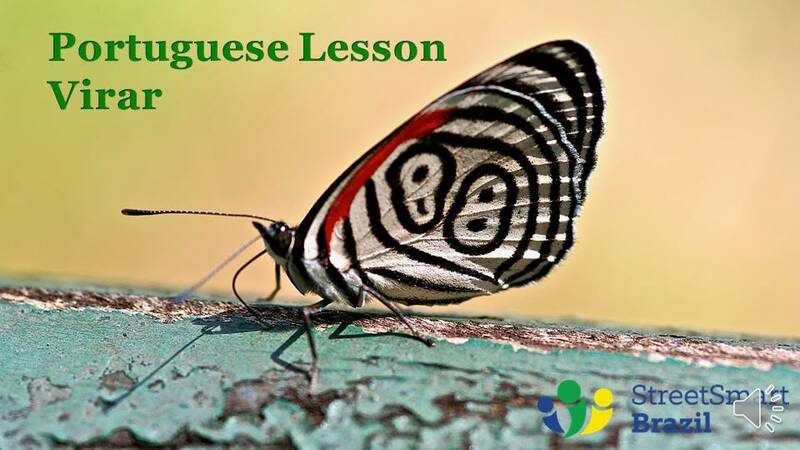 In this Portuguese lesson you will learn three meanings of the verb virar and two great Brazilian colloquial expressions with the verb. The lesson has 12 examples to make your proficient using the verb virar. Virar is a regular verb ending in –AR. You can find all of its conjugations here. (imagine Carla reading a book or magazine) Carla virou a página e continuou lendo. = Carla turned the page and continued reading. (imagine someone giving you directions in Brazil) No próximo sinal, vire à direita. = At the next light, turn right. Antônio sofreu muito quando Ana foi embora, mas ele finalmente virou a página. = Antônio suffered when Ana left, but he finally moved on. Here we are using the verb Virar as a reflexive verb. I have a lesson about reflexive verbs. Visit the lesson with flashcards here. A girafa ouviu um barulho e se virou para ver o que era. = Cristiana heard noise and turned around to see what it was. Eu me virei para falar com João, perdi o equilíbrio e caí. = I turned around to talk to João, lost my balance, and fell. Virar-se is by itself a colloquial expression that means to get by on one’s own, to manage on one’s own, to work it out for yourself, to fend for yourself. This is a common Brazilian idiomatic expression and I’m sure you will find it useful. Malu não fala inglês, mas ela se vira quando vai aos Estado Unidos. = Malu doesn’t speak English, but she manages on her own when she goes to the US. Não se preocupe comigo. Eu sei me virar. = Don’t worry about me. I know how to fend for myself. Mom: Você sabe com ir do aeroporto para o hotel? Malu: Mãe, fica tranquila. Eu me viro. Mom: Do you know how to get from the airport to the hotel? Malu: Mom, chill out. I’ll figure it out. Sofia saiu de casa aos 17 anos e teve que se virar sozinha. = Sofia left home when she was 17 and had to manage on her own. Boss: Preciso desse relatório amanhã de manhã. José: Eu tenho reuniões o dia todo hoje. Não vou ter tempo para preparar o relatório. Boss: I need this report tomorrow morning. José: I have meetings all day today. I won’t have time to prepare the report. Virar bicho means to lose one’s mind, to become very angry. Literally in Portuguese we are saying to turn into an animal. Cristiano virou bicho quando o comissário de bordo não o deixou embarcar porque o voo estava superlotado. = Cristiano lost it when the flight attendant didn’t let him board because the flight was overbooked.